Description: Learn how loosening up can lead to greater accuracy in your drawings. 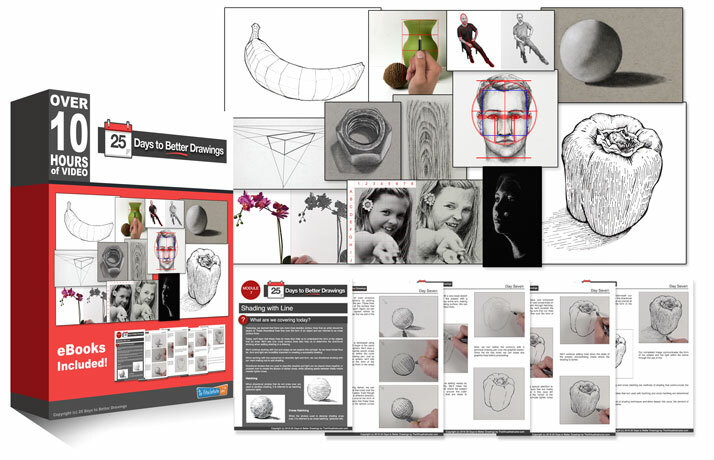 Tackle the challenging shapes of circles and ellipses in this lesson's drawing exercises. Is the photo reference supposed to be the mugs? I get another copy of the hammer from Lesson 2. Hi Matt. I get 5 minutes into the video and it stops. This is the second time I’ve tried and it stops in exactly the same spot. Hi Tracey, The video is playing normally. You may be experiencing buffering. You could try scrolling over the video and clicking on the gear icon. Change the resolution to a lower quality and see if the video plays without stopping for you. I’ve used all different resolutions and refreshed the page. I am still getting stuck on the first mug ellipse – is there anything else I should try? Thank you in advance for the assist. which brand pencils are best for sketching? excellent tutorials sir.m feeling absoluely lucky to find u online.thnx a lot! new member and loving it! i struggle with my perspective with the mugs…can get the circle/ellipses but struggle with the bottom of the mug especially the first one…can’t get it to look as if you’re looking from the top? Doing your course as revision , loving your work Matt! I haven’t worked out how to download your attachments so i’m Using my own objects based on the daily theme. Also find it easier to draw from real life. Is this okay? Hello again Matt. After my comment on 23rd April, I am still experiencing issues with this video. My son, IT literate, has informed me that this is not buffering because of an internet connection issue. His recommendation is that it could be a video player problem. I hope this issue can be resolved. Is it possible to download your videos? I have a copy of the pdf file but my reason for joining your drawing class was the benefit of being able to not only watch you draw but to draw along with you. Thank you for your time. The video is playing normally and I cannot recreate the issue that you’re having. The video player is the same player used for every single video on the site. It is not an issue with the video player. If you are outside of the trial period, you can download the video by clicking on the Download Page link in the gray information box above. Great lesson! Can’t believe the improvement I made between the first and the last mug I drew. Keep up the good works! Hi Matt, have been enjoying your free content and as your summer sale coincided with my birthday two of my lovely children upgraded me, thank you all. Looking forward to continuing this course. I find that making the initial marks from my shoulder is a big improvement but when I try to reinforce the lines with this method it gets very messy and I revert to wrist. Is this a question of practice? As someone who always thought you had to be talented to draw I am so grateful for your enthusiasm and commitment to changing mindsets. Ha, wrote elbow and meant shoulder! Still, I’m simply staggered by the fact that I just assumed everything done with a pencil comes from the wrist! These lessons are awesome! Everything is organised and fully explained, I’m absolutely stunned for how good they are. I have one question though, is it part of the exercises to not use an eraser? Because you haven’t mentioned anything. that noisy, creaking chair of yours reminds me of my creaking chair in my studio!